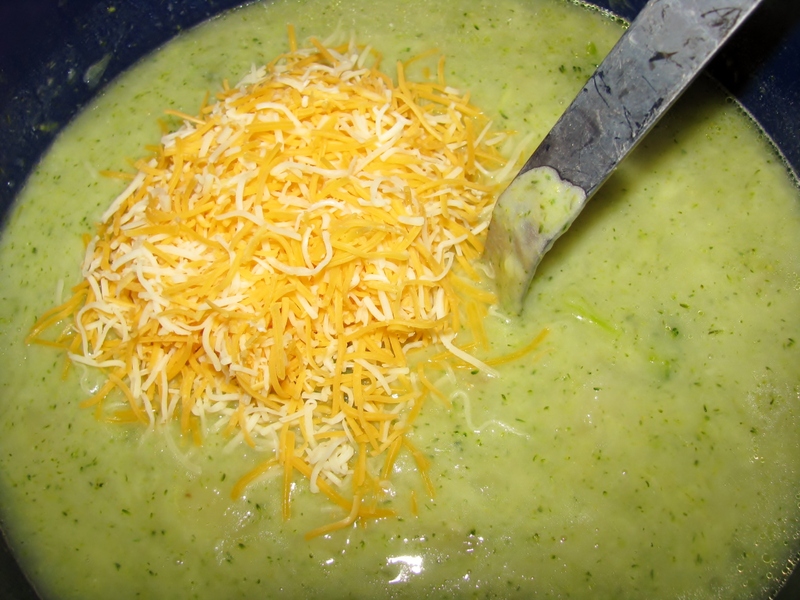 In celebration of all things Irish and green, this is the perfect soup to serve for St. Patrick’s Day or any day. For St. Patty’s Day, it offers a nice, greenish color and it’s full of potatoes, like Ireland, before the Great Potato Famine. The consistency is thick and creamy, but there is no cream involved. Only cheese. Lots of cheese and puréed vegetables. Very simple to make and very delicious. 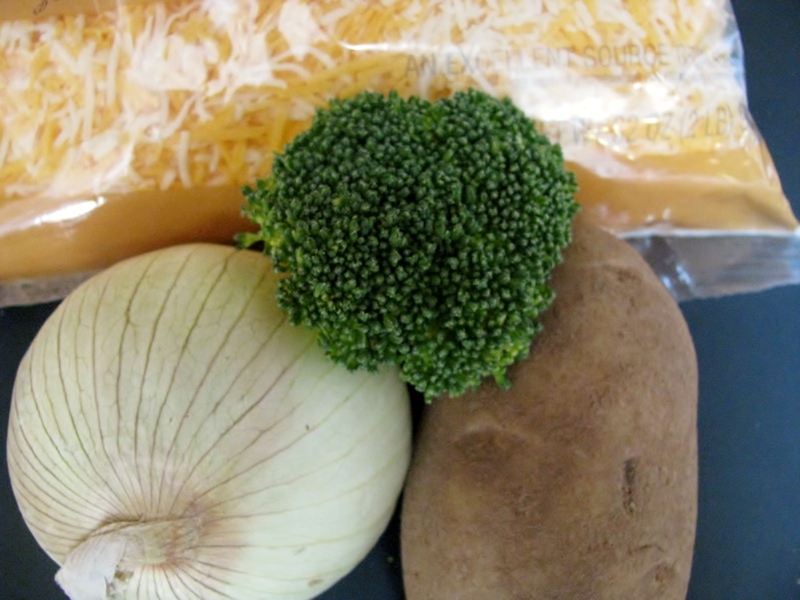 These are the main ingredients – Broccoli, potatoes, onions and cheese. 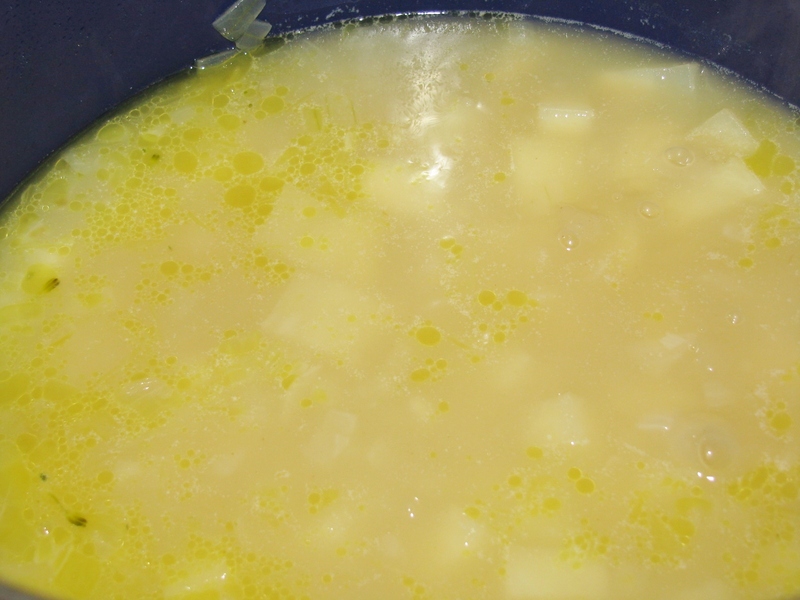 Melt the butter in a stock pot and add the onions and garlic. Stir and cook until soft. I am a lover of sweet, Vidalia onions, so if I forget to mention it in any recipe, or unless I state otherwise, I am using Vidalia onions. Use your favorite onion. “Ogres like onions. Onions have layers. Ogres have layers.” Name that movie! Onions and garlic are cooking. Please do not zoom in on this picture searching for the garlic. You won’t find it. It’s not in there yet. I forgot to add it until after I took the picture. Pretend that I don’t like garlic, so I omitted it. If you don’t like garlic, you can omit it, too. But I love garlic. It’s in the next picture. 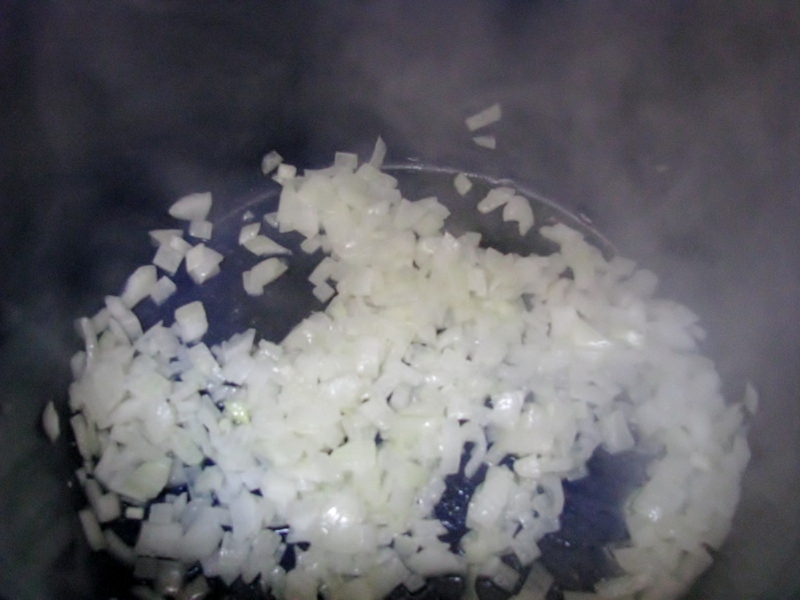 I love this smell – onions and garlic frying in butter. MMMmmm. The garlic is in there now. You just can’t see it. Add the chicken broth. You may use canned broth, but I prefer to use water and bouillon cubes because I always have them in the pantry. The bouillon cubes are in the pantry. Not the water. Add the cubed potatoes. Look at the buttery goodness floating on top. You need 2 – 2.5 pounds of potatoes. If you have a scale, you can weigh them. If you have a new 5 pound bag of potatoes, dump them all out, count them, and put half of them back in the bag. Peel and cube the remaining potatoes. Use 4 or 5 baking potatoes, depending on their size, about 4 – 5 cups. It’s soup. Use what you have and what you like. So easy. 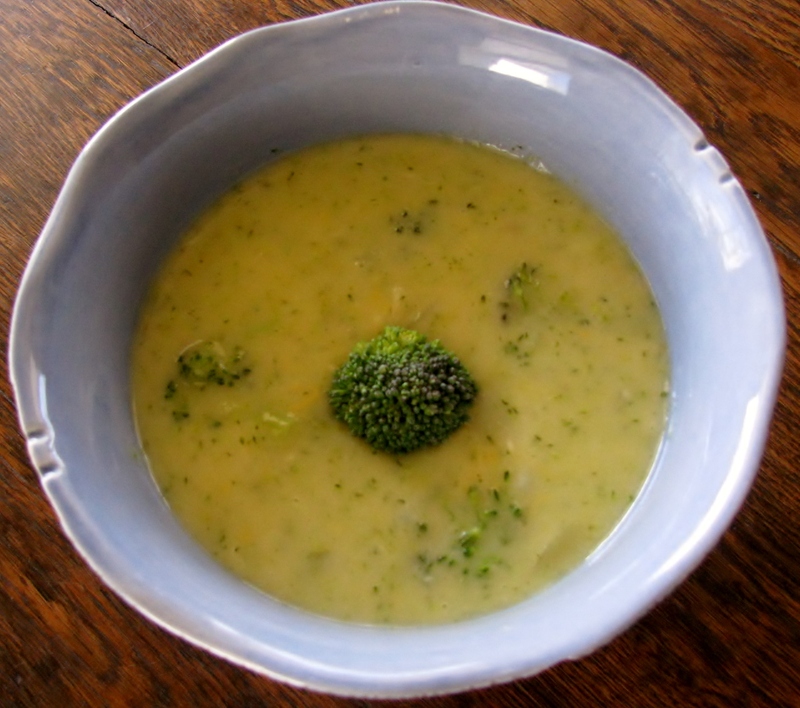 While potatoes are cooking, cut broccoli into bite-sized pieces and cook until tender. 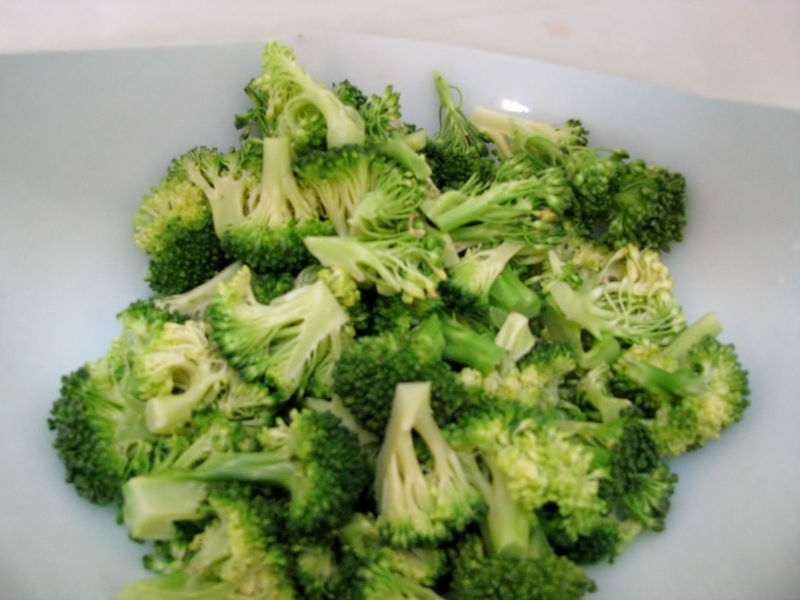 You may steam or microwave the broccoli, just cook it. I microwave it in a bowl, with about 1/4 cup of water, covered with wax paper. 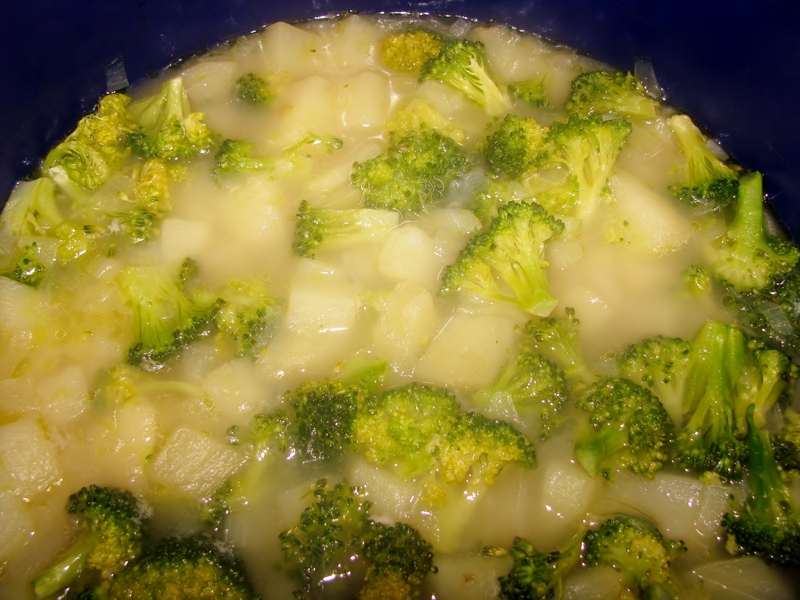 This is virtually all of the cooking the broccoli will get, so if you do not like crispy broccoli in your soup, cook it thoroughly. I like mine to maintain a little of its texture in the soup. 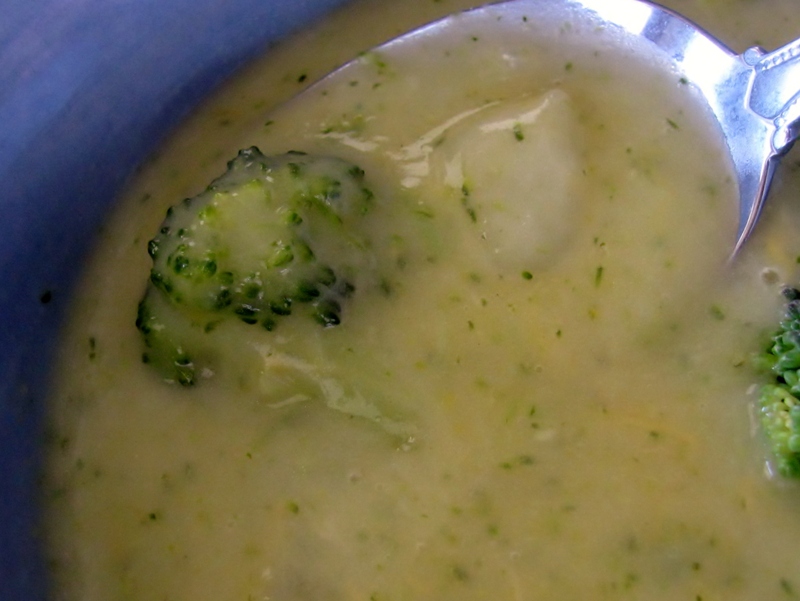 Add the broccoli to the soup. 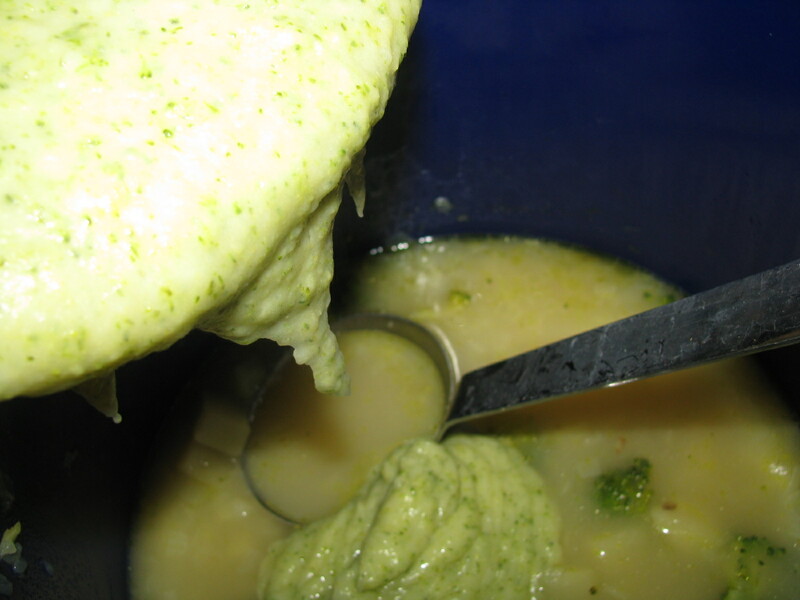 Scoop about half of the potatoes and broccoli out of the soup and place them in a blender or food processor. Purée. If you prefer, you can scoop all of the chunks of broccoli and potatoes into the blender to purée. I prefer to leave about half of the vegetable chunks in my soup. Partially chunky or all puréed. Blender or food processor. It’s your choice. It’s your soup. It’s your world. Pour the puréed veggies back into the soup. Stir to combine. Add the cheese. I used a cheddar blend, but feel free to use any cheese that you love. Not American processed cheese food, please. REAL cheese. Stir until cheese melts. Add salt and pepper to taste. Serve with a crusty baguette and a salad, and enjoy! 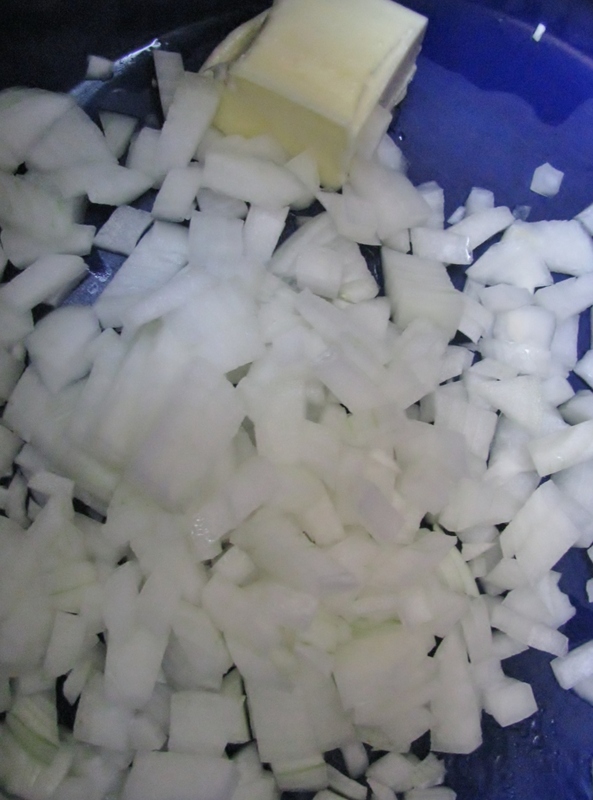 In a large stock pot, melt butter and sauté onions. 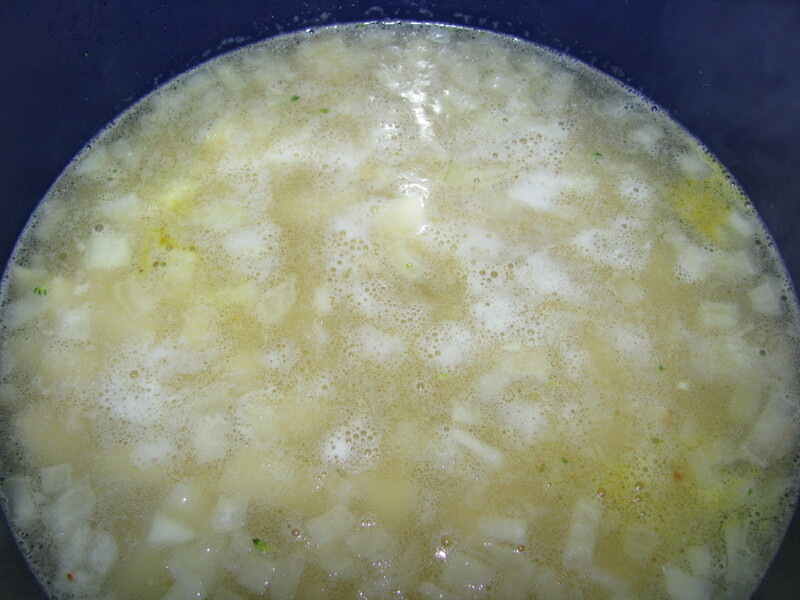 Add water and bouillon cubes. Add potatoes. Cover and cook on medium heat for about 15 minutes or until potatoes are cooked. While potatoes are cooking, chop and cook broccoli. Then add it to the soup. 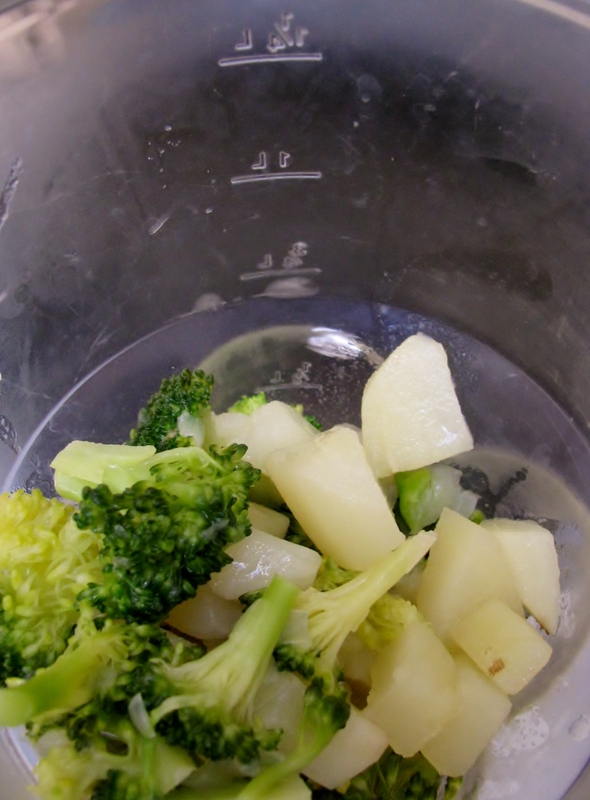 Remove about half of the potatoes and broccoli from the soup and purée in a blender or food processor. Pour puréed mixture back into the soup. Add cheese. Heat all until cheese is melted. Enjoy! What time is dinner? I will be right there! Great pictures and step-by-step easy to follow directions! I need a Geek because links and widgets have me befuddled. If I could figure out how to link it to your menu, I would gladly do that. I’ll try. Thanks for stopping by!